Welcome to Bulls on Crypto Street, an open, community-powered investment information service.  The Bulls on Crypto Street service and network, including the web site at www.bullsoncryptostreet.com and the mobile versions thereof (collectively, the ‘site’), are operated by Bulls on Crypto Street LLC d/b/a Bulls on Crypto Street and its affiliates (collectively, ‘us’, ‘we’, ‘Bulls on Crypto Street’ or the ‘Company’). This Site, including the software and code comprising or used to operate this Site, and all of the text, photographs, images, illustrations, graphics, sound recordings, video and audio-video clips, and other materials available on this Site, including User-Generated Content (defined below) and Feedback (‘Content’), are protected under applicable intellectual property and other laws, including without limitation the laws of the United States and other countries. All Content and intellectual property rights therein are the property of Bulls on Crypto Street or the material is included with the permission of the rights owner and is protected pursuant to applicable copyright and trademark laws. The presence of any Content on this Site does not constitute a waiver of any right in such Content. You do not acquire ownership rights to any such Content viewed through this Site. Except as otherwise provided herein, none of this Content may be used, copied, reproduced, distributed, republished, downloaded, modified, displayed, posted or transmitted in any form or by any means, including, but not limited to, electronic, mechanical, photocopying, recording, or through the use of data mining, robots, spiders, or similar data gathering and extraction tools, or otherwise, without our express prior written permission. You understand that Bulls on Crypto Street does not control, and is not responsible for, content created and posted to the Site by Users (‘User-Generated Content’ or ‘UGC’) posted on or through the Site. Under no circumstances will we be liable in any way for any User-Generated Content. Because we do not control the UGC posted on or through this Site, we cannot and do not warrant or guarantee the truthfulness, integrity, suitability, or quality of that UGC. You also agree and understand that by accessing this Site, you may encounter UGC that you may consider to be objectionable. We have no responsibility for any UGC, including without limitation any errors or omissions therein. We are not liable for any loss or damage of any kind you may claim was incurred as a result of the use of any UGC posted, emailed, transmitted or otherwise made available on or through this Site. The UGC posted on or through this Site expresses the personal opinions of the individuals who posted it and does not necessarily reflect the views of Bulls on Crypto Street?or any person or entity associated with Bulls on Crypto Street. You own User-Generated Content, but we may use it. You own the copyright in any original UGC you post. We do not claim any copyrights in UGC. However, by using this Site you are granting us and our subsidiaries, affiliates, successors and assigns, a non-exclusive, fully-paid, worldwide, perpetual, irrevocable, royalty-free, transferable license (with the right to sublicense through unlimited levels of sublicensees) to use, copy, modify, distribute, publicly display and perform, publish, transmit, remove, retain, repurpose, and commercialize UGC you post in any and all media or form of communication whether now existing or hereafter developed, without obtaining additional consent, without restriction, notification, or attribution, and without compensating you in any way, and to authorize others to do the same. For this reason, we ask that you not post any UGC that you do not wish to license to us, including any photographs, videos, confidential information, or product ideas. The Bulls on Crypto Street name and logos, all product and service names, all graphics, all button icons, and all trademarks, service marks and logos appearing within the Site, unless otherwise noted, are trademarks (whether registered or not), service marks and/or trade dress of Bulls on Crypto Street (the Bulls on Crypto Street marks). All other trademarks, product names, company names, logos, service marks and/or trade dress mentioned, displayed, cited or otherwise indicated within this Site are the property of their respective owners. You are not authorized to display or use the Bulls on Crypto Street marks in any manner without our prior written permission. You are not authorized to display or use trademarks, product names, company names, logos, service marks and/or trade dress of other owners featured within this Site without the prior written permission of such owners. The use or misuse of the Bulls on Crypto Street marks or other trademarks, product names, company names, logos, service marks and/or trade dress or any other materials contained herein, except as permitted herein, is expressly prohibited. In consideration of your use of this Site, you agree that to the extent you provide personal information to Bulls on Crypto Street, it will be true, accurate, current, and complete and that you will update all personal information as necessary. You agree to use this Site in a manner consistent with any and all applicable rules and regulations. You agree not to upload or transmit through this Site any computer viruses, trojan horses, worms or anything else designed to interfere with, interrupt or disrupt the normal operating procedures of a computer. Any unauthorized modification, tampering or change of any information, or any interference with the availability of or access to this Site is strictly prohibited. In addition, you are strictly prohibited from (1) recording the contents of any portion of the Site (including without limitation chat rooms, video or audio updates and screensharing sessions) by any means, including by video recording, for any purpose, and (2) disseminating such recordings to any person or entity. You agree that any violation of this provision will cause Bulls on Crypto Street irreparable harm for which money damages are difficult to calculate. In the event that you violate this provision, you therefore consent to Bulls on Crypto Street obtaining any injunctive or other equitable relief without the necessity of posting a bond to prevent further violations of this provision. We reserve all rights and remedies available to us. The Site will include certain services that are available via your mobile phone (‘Mobile Services’). We will not charge for these Mobile Services. However, your carrier’s normal messaging, data and other rates and fees will still apply. You should check with your carrier to find out what plans are available and how much they cost. In addition, downloading, installing, or using certain Mobile Services may be prohibited or restricted by your carrier, and not all Mobile Services may work with all carriers or devices. Once Mobile Services are available, you should check with your carrier to find out if the Mobile Services will work with your mobile devices, and what restrictions, if any, may be applicable to your use of such Mobile Services. By using the Mobile Services, you agree that we may communicate with you by SMS, MMS, text message or other electronic means to your mobile device and that certain information about your usage of the Mobile Services may be communicated to us. In the event you change or deactivate your mobile telephone number, you agree to promptly update your Bulls on Crypto Street account information to ensure that your messages are not sent to the person that acquires your old number. Bulls on Crypto Street is a service that aggregates trading data and research into a portal. None of Bulls on Crypto Street or any of its employees, contractors, or shareholders or affiliates are an investment advisory service or a registered investment advisor or broker-dealer and do not purport to recommend or suggest which securities customers should buy or sell for themselves. We shall have no liability for investment or other decisions based upon any Content and/or decisions based upon a contrarian view of any Content. We specifically disclaim any and all liability or loss arising out of any action taken in reliance on Content, including but not limited to market value or other loss on the sale or purchase of any company, property, product, service, security, instrument, or any other matter. Bulls on Crypto Street engages in general trader education and training. This website is for general educational and informational purposes only and has not been prepared for any other purpose and is not based on any specific investment objectives. The indicators, strategies, columns, articles and all other features of Company’s products (collectively, the ‘Information’) are provided for informational and educational purposes only and should not be construed as investment advice. Examples presented on Company’s website are for educational purposes only, and the simulated trading program offered in the course is hypothetical and does not represent actual trading. Accordingly, you should not rely solely on the Information in making any investment. Rather, you should use the Information only as a starting point for doing additional independent research in order to allow you to form your own opinion regarding investments. You should always check with your licensed financial advisor and tax advisor to determine the suitability of any investment. None of Bulls on Crypto Street or any of its employees, contractors, or shareholders are related to or make any guarantees or warranties regarding or for our affiliates. If you choose to do business with an affiliate of Bulls on Crypto Street you recognize the risk(s) in doing so and are fully aware that none of Bulls on Crypto Street or any of its employees, contractors, or shareholders can be held liable for potential losses or negligence of others. You hereby agree that you are solely responsible for addressing such risks. Bulls on Crypto Street shall not accept any liability with respect to the accuracy or completeness of any Information herein, or omitted to be included herein, or any Information provided, or omitted to be provided, by any third party. All Information is subject to change without notice. The Information may include forward-looking statements which are based on our current opinions, expectations and projections. We undertake no obligation to update or revise any forward-looking statements. Actual results could differ materially from those anticipated in the forward-looking statements. It should not be assumed that the methods, techniques, or indicators presented on or in connection with the Site will be profitable or that they will not result in losses. Past results of any individual trader or trading system published by Company are not indicative of future returns by that trader or system, and are not indicative of future returns that may be realized by you. Individual trading results will vary. Performance depends on each student?s own skills, time commitment and effort. Graduates of the Bulls on Crypto Street educational program participating in the video testimonial have not been compensated and results may not be typical. U.S. Government Required Disclaimer – Commodity Futures Trading Commission – Futures and Options trading has large potential rewards, but also large potential risk. You must be aware of the risks and be willing to accept them in order to invest in the stock/options markets. Don?t trade with money you can?t afford to lose. This is neither a solicitation nor an offer to buy or sell futures or options. No representation is being made that any account will or is likely to achieve profits or losses similar to those discussed via this website, and media referenced. The past performance of any trading system or methodology is not necessarily indicative of future results. WE MAKE NO REPRESENTATIONS OR WARRANTIES WITH RESPECT TO THIS SITE OR ITS CONTENT, OR ANY PRODUCT OR SERVICE AVAILABLE ON OR PROMOTED THROUGH THIS SITE. THIS SITE AND ALL OF ITS CONTENT (INCLUDING USER-GENERATED CONTENT) ARE PROVIDED ON AN ‘AS IS’, ‘AS AVAILABLE’ BASIS, WITHOUT REPRESENTATIONS OR WARRANTIES OF ANY KIND. TO THE FULLEST EXTENT PERMITTED BY LAW, BULLS ON CRYPTO STREET, ITS AFFILIATES, AND THEIR SERVICE PROVIDERS AND LICENSORS DISCLAIM ANY AND ALL REPRESENTATIONS AND WARRANTIES, WHETHER EXPRESS, IMPLIED, ARISING BY STATUTE, CUSTOM, COURSE OF DEALING, COURSE OF PERFORMANCE OR IN ANY OTHER WAY, WITH RESPECT TO THIS SITE, ITS CONTENT, AND ANY PRODUCTS OR SERVICES AVAILABLE OR PROMOTED THROUGH THIS SITE. WITHOUT LIMITING THE GENERALITY OF THE FOREGOING, BULLS ON CRYPTO STREET, ITS AFFILIATES, AND THEIR SERVICE PROVIDERS AND LICENSORS DISCLAIM ALL REPRESENTATIONS AND WARRANTIES (A) OF TITLE, NON-INFRINGEMENT, MERCHANTABILITY AND FITNESS FOR A PARTICULAR PURPOSE; (B) RELATING TO THE SECURITY OF THIS SITE; (C) THAT THE CONTENT OF THIS SITE IS ACCURATE, COMPLETE OR CURRENT; OR (D) THAT THIS SITE WILL OPERATE SECURELY OR WITHOUT INTERRUPTION OR ERROR. WE DO NOT REPRESENT OR WARRANT THAT THIS SITE, ITS SERVERS, OR ANY TRANSMISSIONS SENT FROM US OR THROUGH THIS SITE WILL BE FREE OF ANY HARMFUL COMPONENTS (INCLUDING VIRUSES). THEREFORE, YOU SHOULD EXERCISE CAUTION IN THE USE AND DOWNLOADING OF ANY CONTENT OR MATERIALS AND USE INDUSTRY-RECOGNIZED SOFTWARE TO DETECT AND DISINFECT VIRUSES. WITHOUT LIMITING THE FOREGOING, YOU UNDERSTAND AND AGREE THAT YOU DOWNLOAD OR OTHERWISE OBTAIN CONTENT, DATA OR OTHER MATERIAL FROM OR THROUGH THE SITE AT YOUR OWN DISCRETION AND RISK AND THAT YOU WILL BE SOLELY RESPONSIBLE FOR YOUR USE THEREOF AND ANY DAMAGES TO YOUR MOBILE DEVICE OR COMPUTER SYSTEM, LOSS OF DATA OR OTHER HARM OF ANY KIND THAT MAY RESULT. BULLS ON CRYPTO STREET does not endorse and is not responsible for statements, advice and opinions made by anyone other than authorized BULLS ON CRYPTO STREET spokespersons. WE DO NOT ENDORSE AND ARE NOT RESPONSIBLE FOR ANY statements, advice or opinions CONTAINED IN USER-GENERATED CONTENT AND SUCH statements, advice AND opinions DO NOT IN ANY WAY REFLECT THE STATEMENTS, ADVICE AND OPINIONS OF BULLS ON CRYPTO STREET. WE DO NOT MAKE ANY REPRESENTATIONS OR WARRANTIES AGAINST THE POSSIBILITY OF DELETION, MISDELIVERY OR FAILURE TO STORE COMMUNICATIONS, PERSONALIZED SETTINGS, OR OTHER DATA. YOU ACCEPT THAT OUR OWNERS, OFFICERS, DIRECTORS, EMPLOYEES AND OTHER REPRESENTATIVES SHALL HAVE THE BENEFIT OF THIS CLAUSE. TO THE FULLEST EXTENT PERMITTED BY APPLICABLE LAWS WE, ON BEHALF OF OUR OWNERS, DIRECTORS, OFFICERS, EMPLOYEES, AGENTS, SUPPLIERS, LICENSORS AND SERVICE PROVIDERS, EXCLUDE AND DISCLAIM LIABILITY FOR ANY LOSSES AND EXPENSES OF WHATEVER NATURE AND HOWSOEVER ARISING INCLUDING, WITHOUT LIMITATION, ANY DIRECT, INDIRECT, GENERAL, SPECIAL, PUNITIVE, INCIDENTAL OR CONSEQUENTIAL DAMAGES; LOSS OF USE; LOSS OF DATA; LOSS CAUSED BY A VIRUS; LOSS OF INCOME OR PROFIT; LOSS OF OR DAMAGE TO PROPERTY; CLAIMS OF THIRD PARTIES; OR COSTS OF ANY ENGINE ARISING OUT OF OR IN ANY WAY CONNECTED WITH YOUR USE OF THE SERVICES OF ANY BROKERAGE COMPANY; OR OTHER LOSSES OF ANY KIND OR CHARACTER, EVEN IF WE HAVE BEEN ADVISED OF THE POSSIBILITY OF SUCH DAMAGES OR LOSSES, ARISING OUT OF OR IN CONNECTION WITH THE USE OF THIS SITE. YOU ASSUME TOTAL RESPONSIBILITY FOR ESTABLISHING SUCH PROCEDURES FOR DATA BACK UP AND VIRUS CHECKING AS YOU CONSIDER NECESSARY. THIS LIMITATION OF LIABILITY APPLIES WHETHER THE ALLEGED LIABILITY IS BASED ON CONTRACT, TORT (INCLUDING NEGLIGENCE), STRICT LIABILITY OR ANY OTHER BASIS.